Recently some of our favorite nurseries in Alabama sent spring shipments of shrubs, a few trees and the beginning of our perennial stock…perhaps you’ve seen the mass of green in the parking lot! 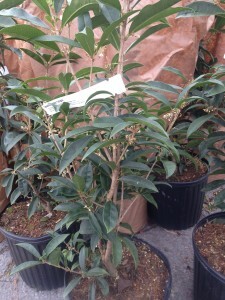 In addition to old southern favorites like oak leaf hydrangeas, gardenias and azaleas, (among them the deciduous, fragrant Florida Flame and ‘Varnadoe’ azaleas) and sweet tea olives, including Osmanthus fragrans ‘Fudzhingou’ (a particularly floriferous selection), we also offer the tough, tried and true cleyera, some pyramid hollies that would be great in containers, and the blue flowered butterfly and bee magnet, Vitex ‘Shoal Creek’. 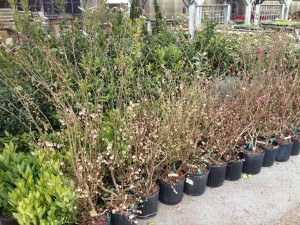 If you need even more tough plants we have ‘Mary Nell’, ‘Nellie Stephens, and ‘Emily Bruner’ hollies. Or, if you have a spot or large planter for a specimen plant, the limbed up Burford hollies are beautiful. 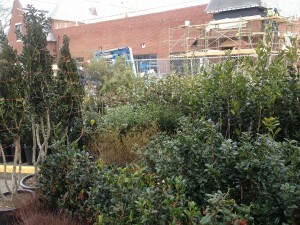 ‘Snowball’ and ‘Awabuki’ viburnums, anise and leucothoe…so much more that could be beautiful additions to your landscape! Knockout roses have been around for a few years – if you haven’t tried the yellow or white selections, we have them now. 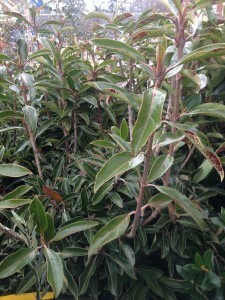 And, if you need more ornamental shrubs have you tried blueberries? In addition to white blooms in the spring and delicious fruit in early summer they also have wonderful fall color – we have some beautiful plants here if this is something you’d like to try. These blueberries are loaded with buds! This is a small sampling of what we have in stock. Please stop in to see the other offerings – new arrivals will be coming in weekly! This entry was posted in Perennials, Spring, Tree/Shrubs and tagged 'emily bruner' holly, 'mary nell' holly, 'nellie stephens' holly, anise, azaleas, blueberry bushes, burford holly, gardenias, hollies, hydrangeas, leucothoe, magnolia 'butterflies', magnolias, oak leaf hydrangeas, osmanthus 'fudzinghou', osmanthus fragrans, snowball viburnum, spring, spring shipments, sweet tea olive, viburnum, vitex on March 8, 2013 by Kris Blevons.